Today i will discuss about basic Difference of Huawei MA5620 and MA5626 MDU. environment-friendly and energy conservation, and can be used on workbenches and installed in corridors and cabinets, facilitating installation and maintenance. 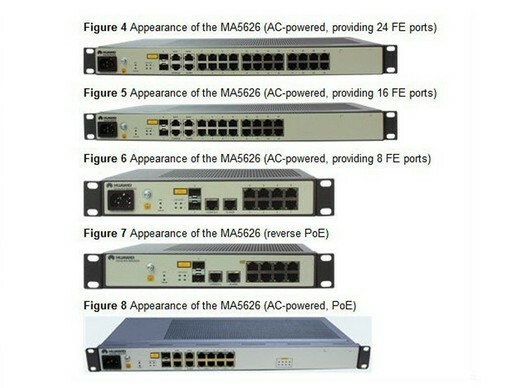 The MA5620 and MA5626 are used on an FTTB network and are installed in a network cabinet in a corridor. They connect to the OLT optical line terminal through GPON uplink ports and connect to PCs by using category-5 cables to provide high-bandwidth broadband, voice, and video services and connect to telephones by using twisted pairs to provide plain old telephone service (POTS) services. they connect to the camera or wireless Access Point (AP) through the FE port. In this manner, the MA5620, MA5626, provide transmission channels for videos and Wi-Fi Internet surfing services, meeting requirements for Wi-Fi coverage and video monitoring in diversified fields. Note that the MA5626 support Power over Ethernet (PoE) technology; therefore, issues related to AP or camera power can be resolved.